This Non-Smoking condo is beautifully maintained and decorated with Oriental art and antiques. Other comparable direct oceanfront corner condos in our complex rent for more. The two bedroom/two bath corner units are among the largest on Maui. We have ocean views from every room including both bathrooms. We are on the sixth floor of Building 2. 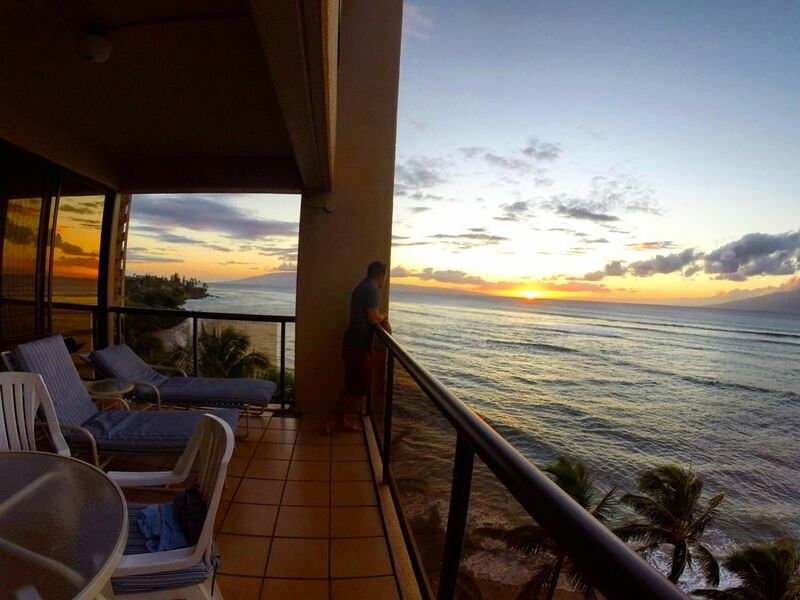 Only the corner units at Sands of Kahana like ours have views from both Master bedrooms. Located on a beautiful sandy beach. When the wind and waves are up, we can watch surfers to the left and wind surfers & kite surfers to the right of the property. Seasonal whale watching right from the condo, bring your binoculars! Located half-way between the Kaanapali and Kapalua resorts with their world class golf courses. Unobstructed views of the islands of Lanai and Molokai from end to end. Glorious sunset views! Only 30 feet from the Pacific Ocean, the sound of the waves lulls you to sleep. The Sands of Kahana has an on-site restaurant, tennis courts, pool, hot-tub, kiddie pool, koi pond, work-out room and activities desk. We vacation rented at Sands of Kahana when it was still under construction. We loved the views and the spaciousness of the condos. We loved the area, the quiet and the location half way between Kaanapali and Kapalua. It was a dream come true to finally own there. In front of the condo we can see sea turtles pop their heads up and swim along. To the left we can watch surfers from our lanai and to the right, on windy days, watch wind and kite surfers. When the whales are there you can watch them without even leaving the condo. At night the moon over the ocean is breathtaking and we can constantly hear the ocean waves. As many times as I've been there, I still get excited even seeing ads about Maui. DVD Player, Full Kitchen with Cookware and Utensils, Washer and Dryer, Pool, Hot Tub, Separate Kid's Pool Pavilion, Gas BBQ, Large Corner unit, 1700 Square feet, 2 Balconies, Sunset views, Beach Volleyball.